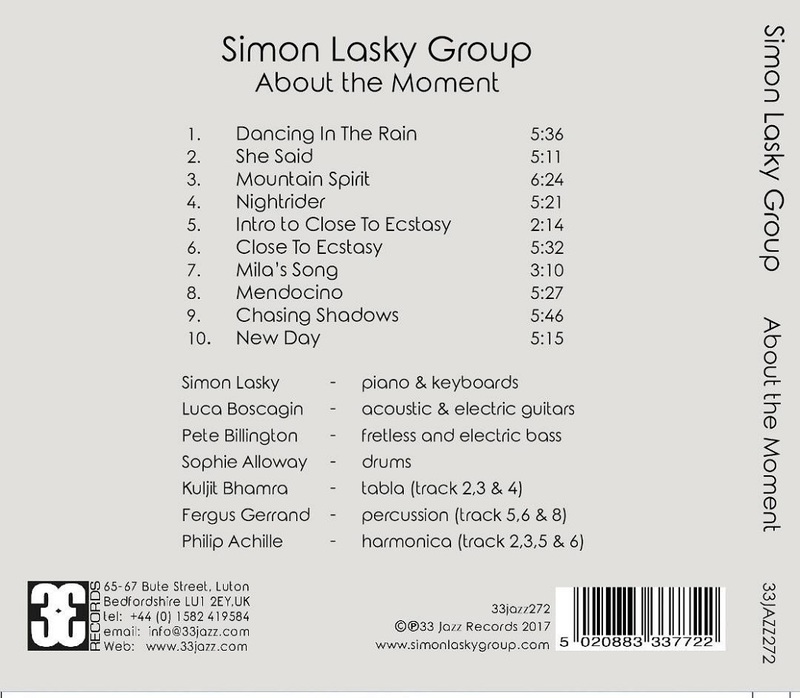 UK based pianist/ composer, Simon Lasky recently released his follow-up album to his debut release, “Story Inside”. 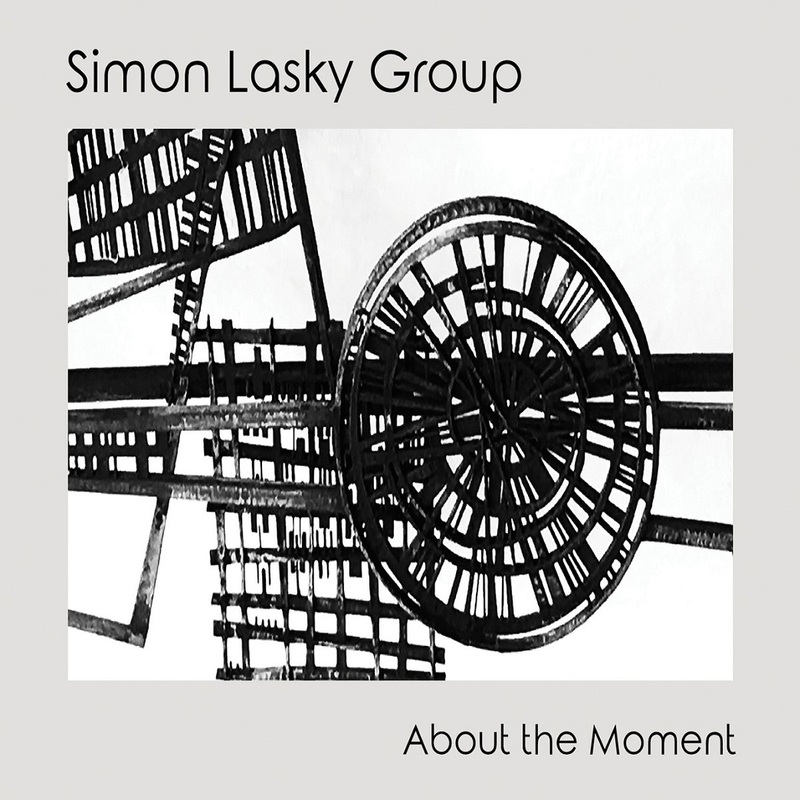 Titled “About The Moment”, this new CD sees Simon in a quartet setting with a number of guest players including Kuljit Bhamra (tabla) Fergus Gerrard (percussion) and Phillip Achille (harmonica) . Rounding out the quartet is Pete Billington on Bass, Sophie Alloway on Drums and Luca Boscagin Guitar. Simon Lasky is one of those musicians that has been successfully able to put one foot firmly in both the Classical and Jazz world without compromise. With this in mind, it’s not surprising that trait’s of the classical genre appear in both his playing and compositional style. The compositions and arrangements are tightly structured and at times symphonic in nature however at the same time organic and natural. Simon’s playing style displays the technical discipline of a classical pianist mixed well with the freedom of a jazz musician. In the liner notes Simon states that he has always enjoyed “…those big moments in music, the build up of tension, then a climax followed by the release..” and goes on to mention the great symphonic works of Mahlar, Bruckner and Messian as inspiration. He rightly states that it’s not possible to achieve this symphonic effect with a 6 piece combo however the concept of tension and release can be heard throughout the album both in the compositions themselves and the improvisations. I can remember in my student days, a lecturer answering when asked about the certainties in life “that the only three things you can be sure of in life are death, taxes and the fact the guitar and piano never work together.” Of course, this was meant in jest and has been proved incorrect by Herb Ellis and Oscar Peterson, Bill Evans and Jim Hall etc. On “About The Moment” Simon Lasky and Luca Boscagin also prove this statement incorrect. The two consistently stay in their own lane giving each other the room to move while at times coming together creating a seamless composite. The opening theme of the first track on the album “Dancing in the Rain” is a perfect example. Bassist Pete Billington, is strong throughout the album providing together with Sophie Alloway (drums) a rock solid base for the ensemble and when requested, stepping out with a number of beautiful melodic solo’s for example on “She Said” and “Chasing Shadows”. The addition of the special guests Kuljit Bhamra (tabla) and Fergus Gerrard (percussion) without doubt add value to the line-up, these two together with Alloway provide a rhythmic bed that is omnipresent throughout the album but never intrusive. The third guest on the Album is Phillip Achille (harmonica) who provides a melodic kaleidoscope adding to the albums sound-scape. 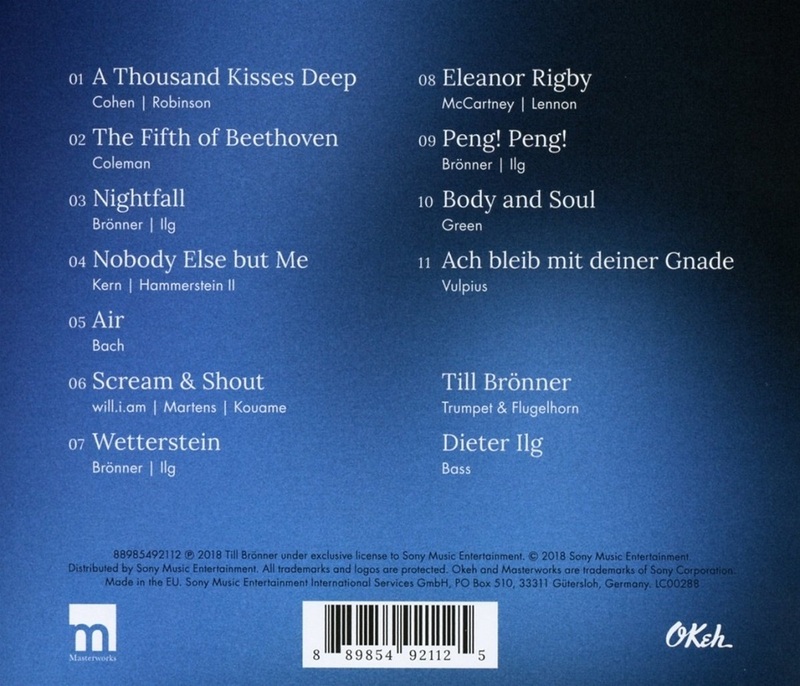 It’s a difficult task finding any negative points on this album, however if there is one it would be the placement in the track listing of “Mila’s Song”. This solo piano track differs so much in style from the compositions on the rest of the album that in my opinion, the placement within the track list breaks the flow of the album. 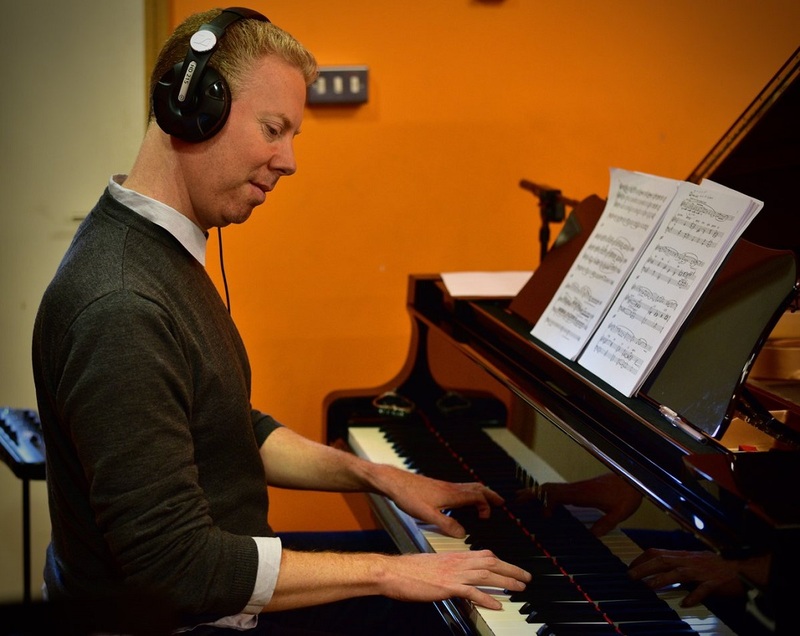 After listening not only to “About the Moment” but also Simon’s previous release, “Story Inside” it’s clear to see Simons development not only as a composer but also as a pianist. All in all “About The Moment” is a wonderful album that will appeal to a large jazz audience. Highly recommended. 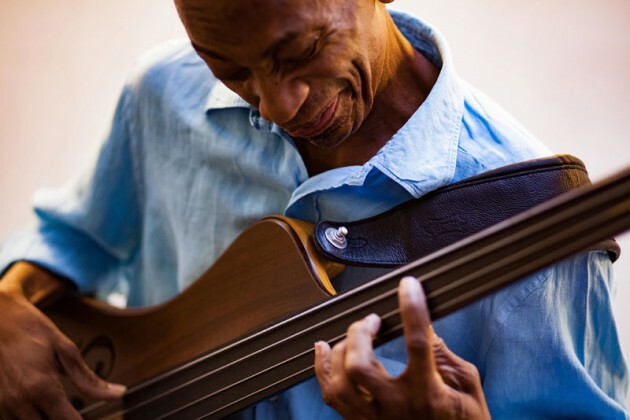 In December bassist Reggie Washington released his latest CD "Rainbow Shadow Vol 2" to great critical acclaim (see review on this platform). To support the release of the album Reggie and his band will play a select number of European dates in some of the continents major jazz venues. Originally from New York, Reggie Washington was a key participant in the Modern Jazz revolution of the 80's and 90's. 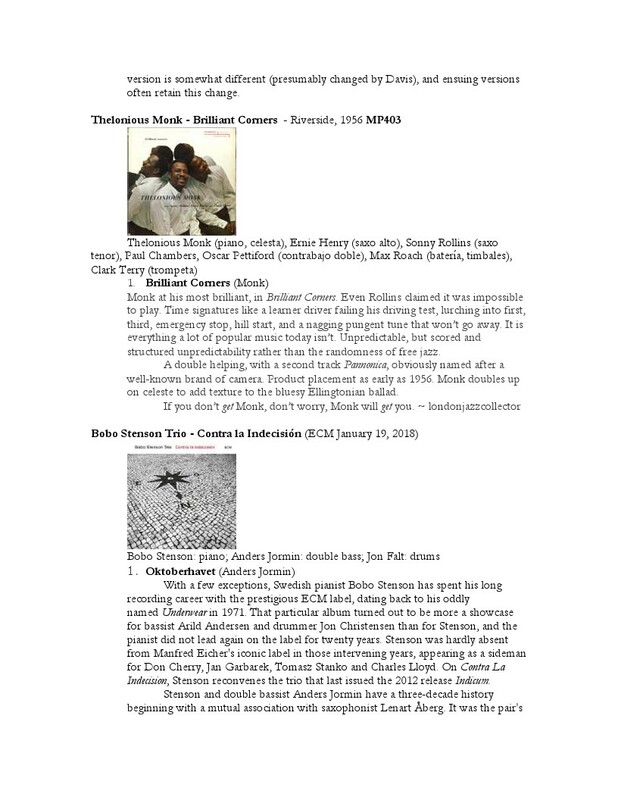 His list of credits include touring, recording and performing musicians as Steve Coleman, Branford Marsalis, Roy Hargrove, Chico Hamilton, Oliver Lake, Cassandra Wilson and Lester Bowie to name just a few. In 2005, Reggie began touring with his own bands and in 2006 he released his first album as a leader. Since then Reggie has released four albums as a leader and led projects collaborating with both American and European musicians including Ravi Coltrane, Gene Lake, Stéphane Galland, Jef Lee Johnson, Erwin Vann, David Gilmore, Jacques Schwarz-Bart and EJ Strickland. "Rainbow Shadow Vol 2" is the follow up to Reggie Washington's successful 2015 release "Rainbow Shadow Vol 1" and the continuation of his tribute to legendary guitarist and singer/songwriter Jef Lee Johnson who died prematurely of complications from pneumonia and diabetes at age 54. The album features Reggie’s current band with Marvin Sewell – Guitar, Dj Grazzhoppa – Turntables and Patrick Dorcean on Drums who (with the exception of Marvin Sewell) will also accompany Reggie on his tour. On the tour the band will be joined by guitarist David Gilmore (Wayne Shorter, Steve Coleman). Reggie stated when asked about the addition of David Gilmore to the line-up "We have shared the stage together with many great artists and also our own projects over the last 30 years. His mastery of the instrument & knowledge of "Rainbow Shadow - A Tribute to Jef Lee Johnson" makes him a perfect fit." Some musical constellations are so obvious that the question arises why they hadn’t become reality long ago. And when they finally do see the light of day, they appear so familiar to us as if we’d known them for ages. One of these constellations is the duo formed by the trumpeter Till Brönner and the bass player Dieter Ilg. They are, in the full sense, soul-mates, no matter how threadbare the term might sound. They often seek to do the very same thing on their antithetical instruments, even if they express it in quite different ways. As a result, they fit each other to a tee. This osmosis is now plain to hear on their joint début album, Nightfall. The choice of pieces is sufficient proof that the musicians did not want to pin themselves down to a fixed classification or pigeonhole. If jazz was ever an expression of individual liberty, then this independence is manifest here, devoid of myths, in their approach to the material and their spontaneous treatment of it. 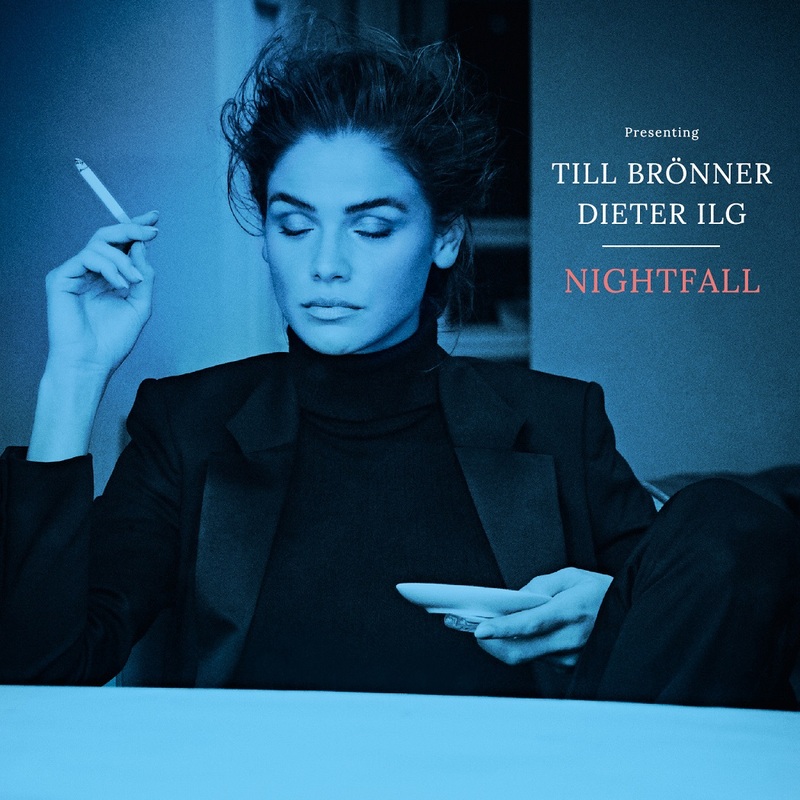 Anything can be done if you only want to do it, and Brönner and Ilg certainly do. 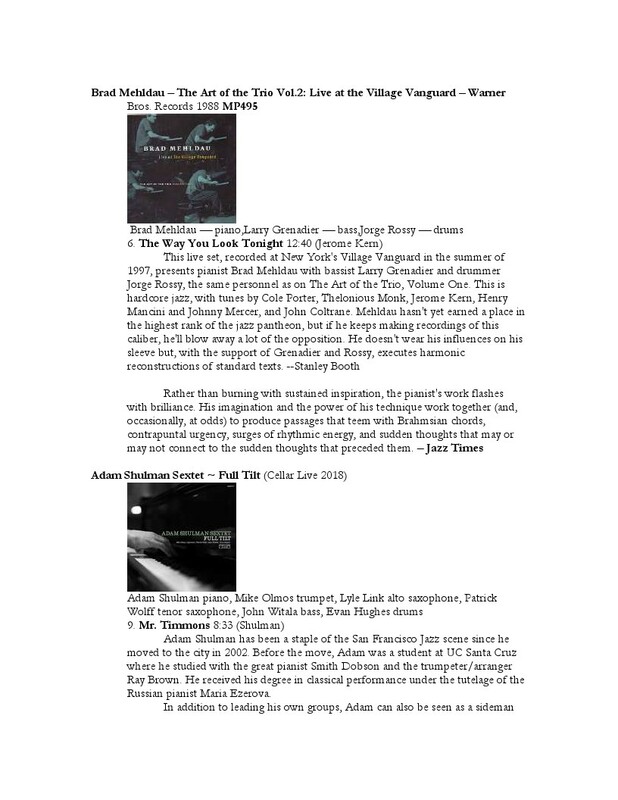 Songs by Leonard Cohen, the Beatles and Britney Spears, pieces by Jerome Kern, Johnny Green and Ornette Coleman, compositions by Johann Sebastian Bach and Melchior Vulpius, even a few creations of their own: the range of intentions and influences on display is almost unparalleled. In each song the two men find inventive new angles and perspectives. There aren’t any solos in the classical jazz sense. As in any good conversation that unfolds naturally, the lines of argument fall now on one side, now on the other. The flow of thoughts is completely free. It’s pressed here into a narrow riverbed only to expand a moment later into a broad delta. Nightfall is many things at once. It’s a début album and, at the same time, the fruit of a long and intensive collaboration between two great storytellers. It’s at once a consummation, a stocktaking and a promise for the future. It’s a resolute dismissal of entrenched prejudices and a passionate affirmation of the freedom and miracle of jazz. The organic blend of willful abandon and understatement celebrated on this album is anything but run-of-the-mill. Not least of all, the album is a refreshing counterfoil in the age of perfectionism. It projects the cathartic discovery that no matter how much one has achieved in life, it’s always worth starting from scratch, over and over again. And if proof is needed, here it is! 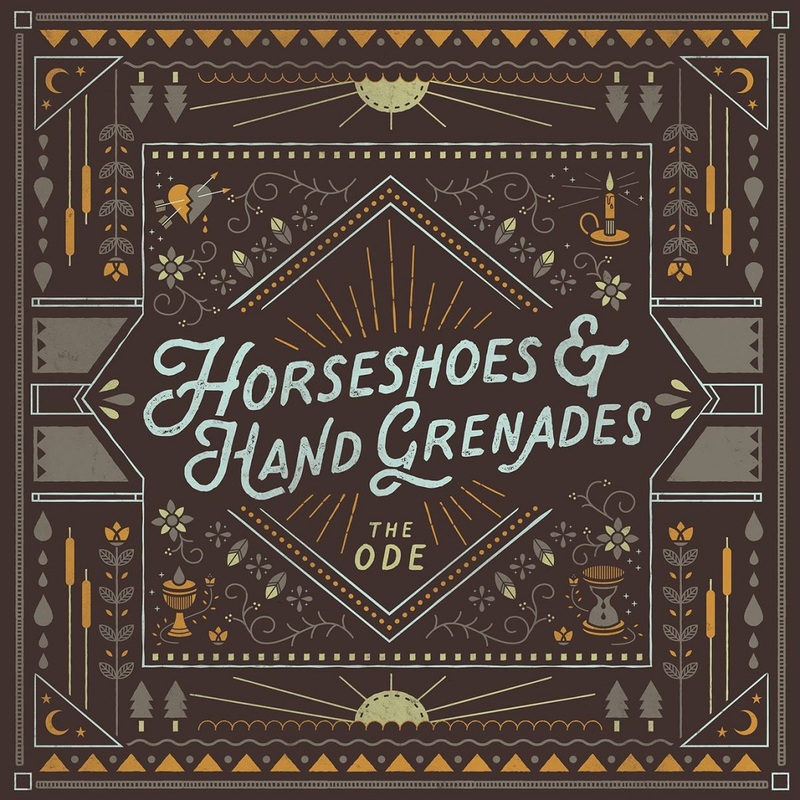 Acclaimed bluegrass/Americana quintet HORSESHOES & HAND GRENADES is set to release their new album The Ode February 16 via Tape Time Records. The Odewill be the debut offering from the new label, which was founded by their friends in the Infamous Stringdusters. The two like-minded bands return to the road together this Wednesday (2/7) in Louisville, KY (full itinerary below). The album's second single, "Steer True," is out now; the album's title track was released in September. 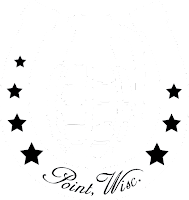 The Ode is quintessential HORSESHOES & HAND GRENADES music from the Wisconsin group: David C. Lynch (harmonica, accordion, spoons, vocals), Collin Mettelka (fiddle, mandolin, vocals), Russell Pedersen (banjo, fiddle, vocals), Adam Greuel (guitar, dobro, vocals) and Samual Odin (bass). Equal parts good-time bluegrass and country lament, the record-their fourth full-length--captures the band at their studio best. After seven years, three albums, innumerable sold out shows, and countless beers, bluegrass mavericks HORSESHOES & HAND GRENADES appropriately consider themselves a "family" on a wild, wonderful, and often whacky roller coaster. The bond between the five gentlemen fuels their creativity and chemistry on stage and in the studio. Produced by Trampled By Turtles frontman Dave Simonett, the album-recorded at Pachyderm Studio in Minnesota, where Nirvana recorded In Utero--marks a point of growth for HORSESHOES & HAND GRENADES. 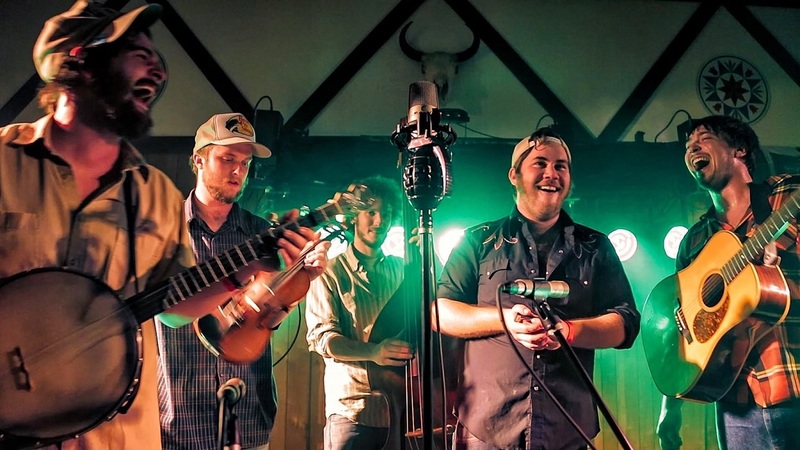 The band's Adam Gruel says, "We've got the bluegrass burner type tunes we're known for on there, but we're experimenting with other elements. Little pieces of everybody are encapsulated in this record. For the first time, we were really conscious of allowing our respective musical curiosities into the fold. Sam drops in a jazz and classical feel. Dave brings that Zydeco, Cajun, and old school blues vibe. Collin turns up with this kinda pop folk energy, and Russell gives us the old-timey banjo feel. For me, I'm trying to play out my singer-songwriter curiosities. There are five songwriters in the band, and we've gotten better at harnessing our individual creativity and bringing it to the collective." 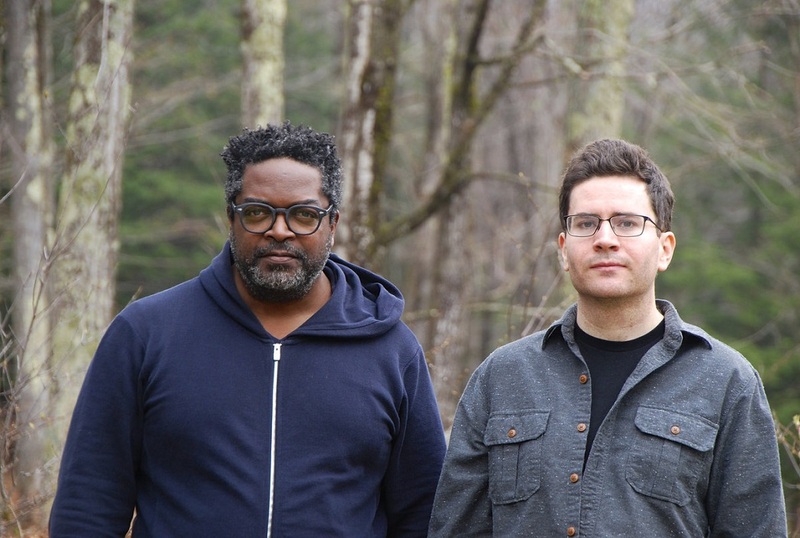 A Dance That Empties is Travis Laplante's latest album-length composition, written for Subtle Degrees, a new two-musician ensemble consisting of Laplante (tenor saxophone) and Gerald Cleaver (drums). The duo's uncategorizable sound evokes everything from contemporary classical music, avant garde jazz, minimalism, technical metal, and sacred world music. Laplante is also the founder/composer of saxophone quartet Battle Trance and the ensemble Little Women. 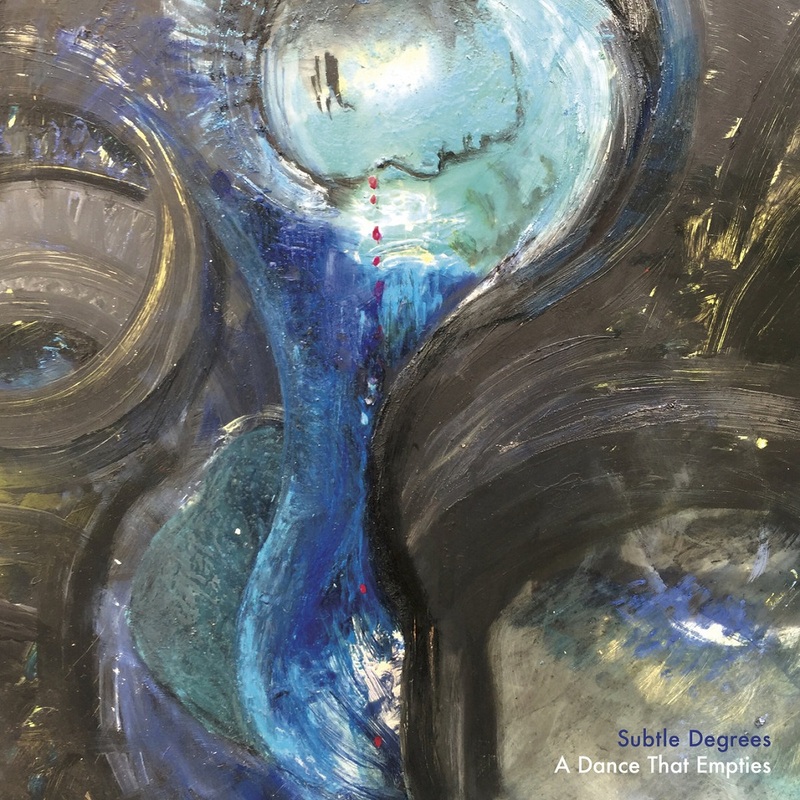 A Dance That Empties is an extremely demanding composition that pushes the players to the limit both technically and physically, while the raw, vulnerable instrumentation makes for an intimately emotional experience for both performers and listeners. 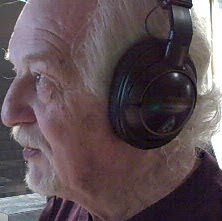 The two have performed together various times over the ensuing 17 years, but Laplante never felt he was quite ready to record with Cleaver. “It got to the point where I took a multiple-year break from playing with him because I felt like I didn’t have enough to bring to the table,” says Laplante. “I needed to practice so I could have more to give to our musical relationship.” Then, in the fall of 2016, Laplante received a commission to compose a piece to be performed at Roulette in Brooklyn the following spring. 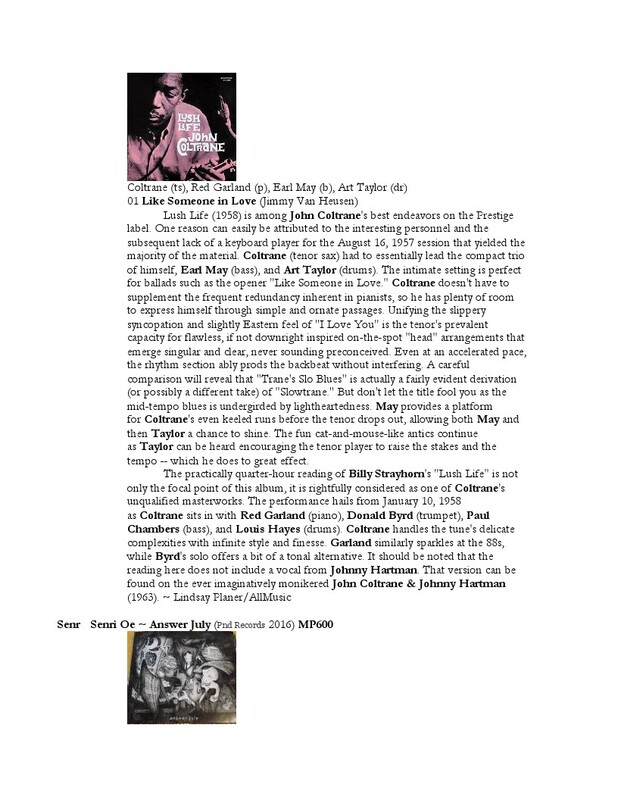 “I knew that this was the perfect opportunity to return to this relationship with Gerald.” And so Laplante began composing an epic-scale work work with Cleaver’s rhythmic virtuosity in mind. 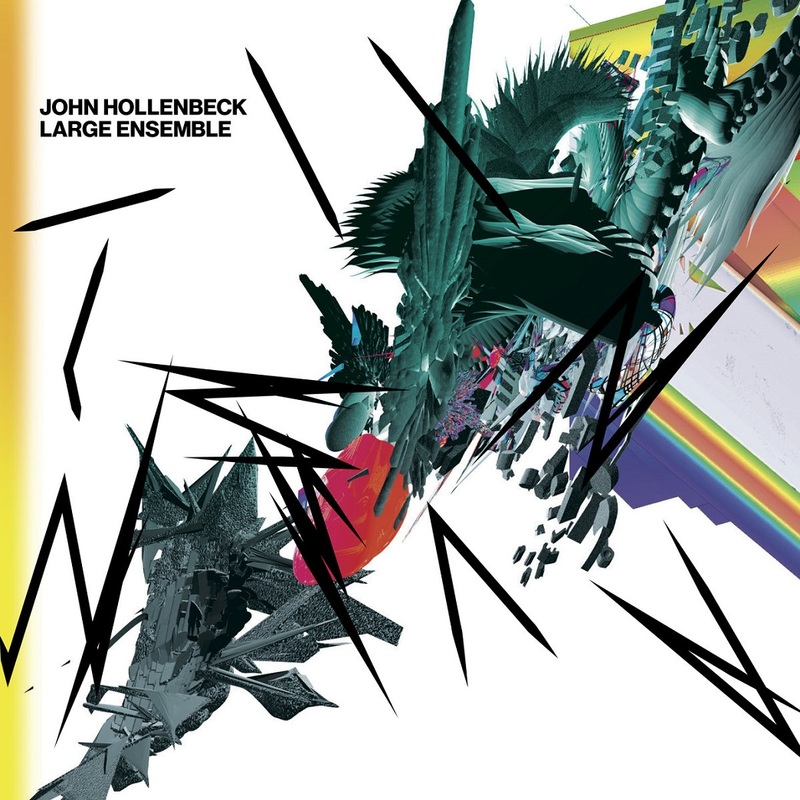 Drummer/composer John Hollenbeck and his 20-piece Large Ensemble will release their third album, All Can Work, January 26 on New Amsterdam Records. The album follows the band’s Grammy-nominated releases A Blessing (2005) and eternal interlude (2009), and pays tribute to the Large Ensemble’s late trumpet player Laurie Frink, a key force in the group and the jazz community. The album title is from an email exchange between Frink and Hollenbeck; the phrase epitomizes the flexible, optimistic resolve that is needed by everyone involved to create a record such as this one. After Laurie Frink’s passing, Hollenbeck read all of her emails and compiled them in chronological order, finding poetry and inspiration in her words. Acclaimed vocalist Theo Bleckmann brings Frink’s words to life in the lyrics of the title track “All Can Work." The composition of the piece is based on one of Frink's teaching exercises. 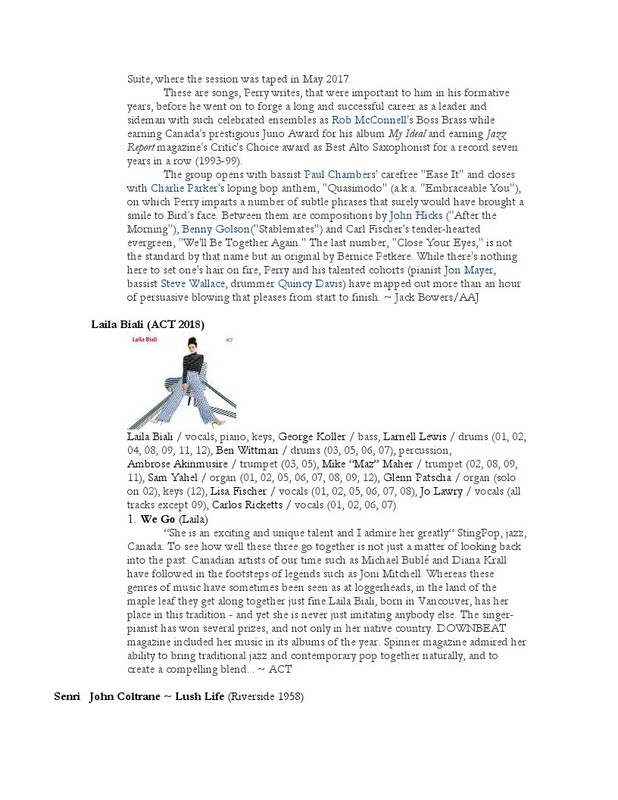 “I really sweated this piece because I wanted it to showcase Laurie’s ever-present humor, her dedication to ‘the music,’ and most importantly our love for her. All Can Work represents The John Hollenbeck Large Ensemble’s accumulation of years rehearsing, recording and performing together since its founding in 1998 — the definitive evolution of an exceptional ensemble that has developed a relationship akin to family (some members of which Hollenbeck has been playing with since high school and college). 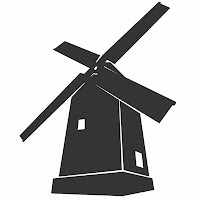 The album also pays tribute to artists who have influenced Hollenbeck most throughout the years: Bob Brookmeyer, Kenny Wheeler, Billy Strayhorn, John Taylor, William Shakespeare, and Piet Mondrian. The album opens with “lud” — an alluring, hypnotic blend of triumphant horns and angular keys. After the title track comes “Elf”, inspired by composer Billy Strayhorn’s piece of the same name that was retitled and repurposed by Duke Ellington as “Isfahan” for the Far East Suite. Hollenbeck’s version is a near-inverse of the original, featuring soprano saxophonist Tony Malaby playing in an impressively high register. Pulsing horns open on “Heyoke”, Hollenbeck’s tribute to composer/trumpeter and flugelhorn player Kenny Wheeler and jazz pianist John Taylor, featuring Hollenbeck’s arrangements of Wheeler’s original. “This kiss” follows, capturing the spirit of Shakespeare’s “Romeo and Juliet” by creating a mood of sweet romance in the present with a foreboding dissonance that foreshadows the future. “From trees” shows Hollenbeck exploring Piet Mondrian’s study of trees in his early works, in particular his unfinished painting "Broadway Boogie-Woogie.” Hollenbeck fittingly incorporates a boogie-woogie feel into the piece while trying to evoke the evolution of the lines of a tree in Mondrian’s earlier paintings to the bold straight black lines in his last. “Long Swing Dream” embodies the first and (so far) only time a piece came to Hollenbeck in an actual dream. Horns pass around a continuous bass line, while Theo Bleckmann voices musings from Cary Grant about Grant's transformative experiences with LSD (the acronym of the song title) deepen the dream-like effect. The album finishes with “The Model” — Hollenbeck’s spirited arrangement of the Kraftwerk original. All Can Work was recorded by James Farber at Avatar Studios in NYC in June 2017 with assistance from Nate Odden. It was mixed by Brian Montgomery, and mastered by Brent Lambert at Kitchen Mastering. It was produced by John Hollenbeck. This project was supported in part by the Doris Duke Performing Artists Awards and fiscally sponsored by Arete Living Arts Foundation with funding provided by The Aaron Copland Fund for Music. 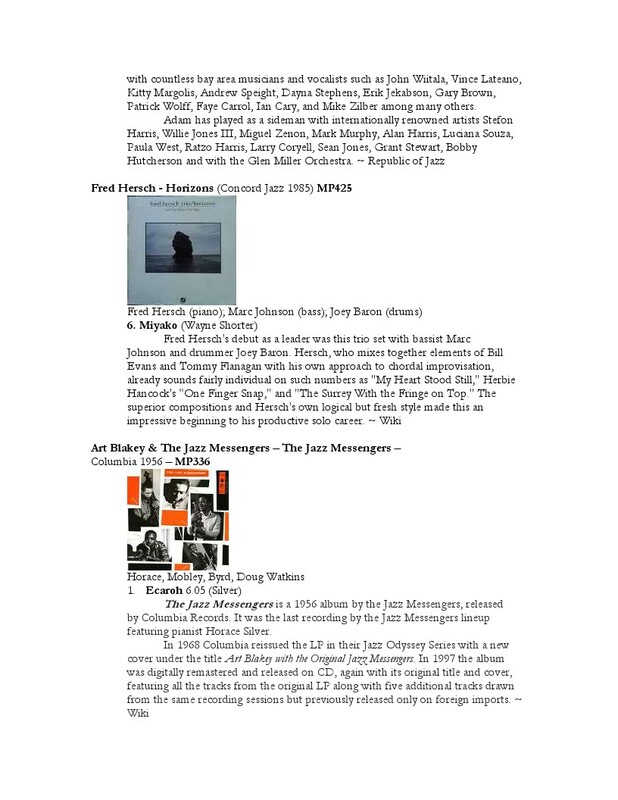 Additional large ensemble releases by John Hollenbeck include: Joys and Desires (Jazz Big Band Graz, 2005), Shut Up and Dance (Orchestre National de Jazz, 2010, Grammy-nominated), Songs I Like A Lot (Frankfurt Radio Big Band, 2013, Grammy-nominated) and Songs We Like A Lot (Frankfurt Radio Big Band, 2015). 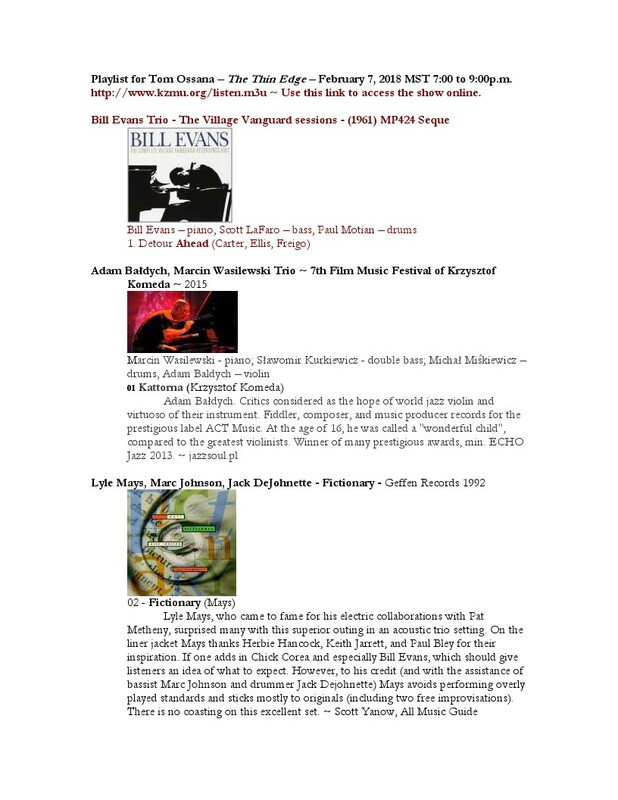 Playlist for Tom Ossana – The Thin Edge – February 7, 2018 MST 7:00 to 9:00p.m. I’ve been looking for recent work by my favorite pianist, Poland’s Marcin Wasilewski, since his “Spark of Life” released by ECM in 2014. Friends in Europe sent this almost ten minutes of his trio (Wasilewski – piano, Slawomir Kurkiewicz – bass and Michal Miskiewicz) with the hope of world jazz, violinist Adam Baldych, in a live performance of Krzysztof Komeda’s “Kattorna”. 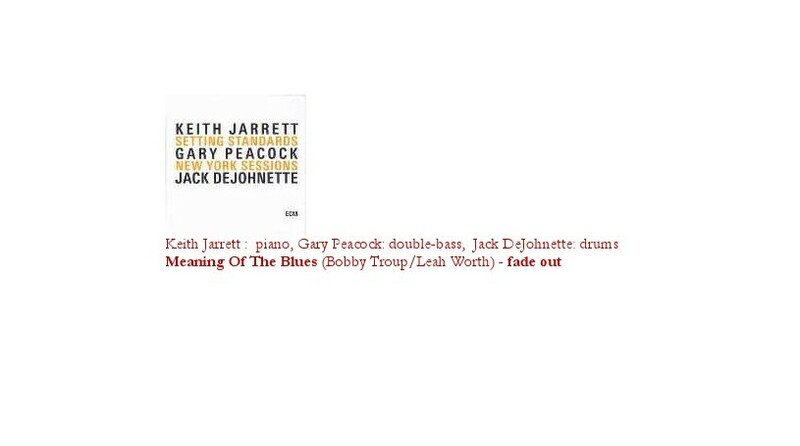 Lyle Mays, Tim Withee’s choice for an American artist who rivals Wasilewski, is next with the title track from his joint effort with bassist Marc Johnson and Jack DeJohnette: “Fictionary” (Geffen Records 1992). Another important pianist of the era, Brad Mehldau, concludes this half-hour with his trio’s treatment of Jerome Kern’s “The Way You Look Tonight” from his “The Art of the Trio Vol. 2: Live at the Village Vanguard” (Warner Bros. 1988) featuring Larry Grenadier (b) and Jorge Rossy (dr). San Francisco based pianist, Adam Shulman returns from last week with “Mr. Timmons” - his salute to pianist Bobby Timmons, an important innovator who left us far too early in 1974 at the age of 38 from cirrhosis. Tenor saxophonist Patrick Wolff improvises followed by Mike Olmos (tp), Lyle Link (as) and Adam’s piano. One of the bright spots of the eighties, pianist Fred Hersch, follows with his cover of Wayne Shorter’s “Miyako” from his “Horizons (Concord Jazz 1985). Marc Johnson makes his second appearance on bass with help from the drums of Joey Baron. My first exposure to The Jazz Messengers happened when I was watching thermonuclear explosions in 1958 at the Marshall Island Atomic Proving Grounds. Horace Silver led the group in the beginning with their breakout “The Jazz Messengers” (Columbia 1956). We’ll hear Silver’s “Ecaroh” (Horace spelled backwards) with solos from Hank Mobley (ts), Donald Byrd (tp) and Silver (p). Art Blakey, who would eventually lead the group, is relatively restrained on the drums. George Shearing, a blind British pianist thoroughly familiar with a stride/swing approach to jazz, finally gets it right after several attempts to master the bop idiom. The result shows up in his 1948 London Records “Consternation” featuring Jack Fallon (b) and bomb-thrower Norman Burns (dr) bringing this half to a close. Miles Davis tackles famed tenor saxophonist Eddie Harris’ “Freedom Jazz Dance” exquisitely in his “Miles Smiles” (Columbia 1967). It was in this remarkable 1966 outing that we got acquainted with the twenty-year-old drumming sensation, Tony Williams. 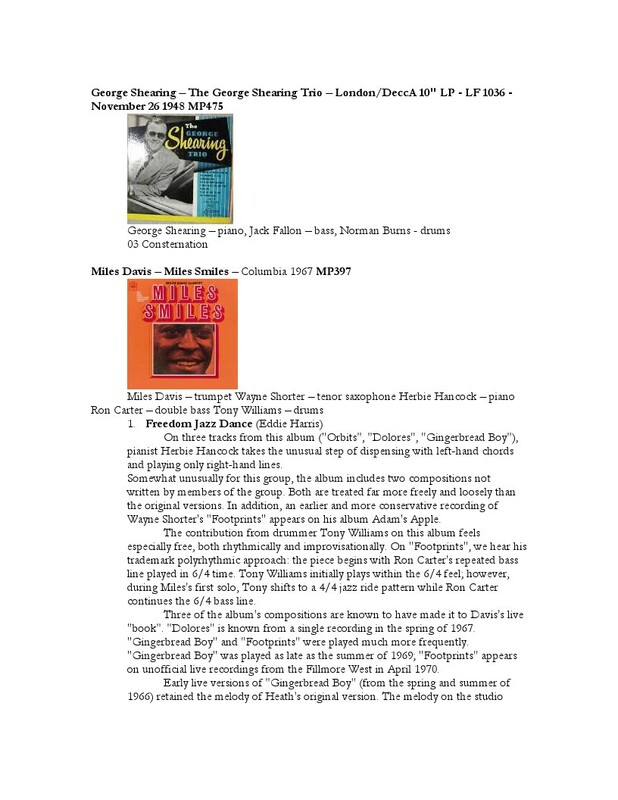 Miles improvises first, followed by Wayne Shorter and Herbie Hancock. Bassist Ron Carter shines. Cornell Belcher’s Brilliant Corners, one of the premier strategists in democratic politics, takes its name from Thelonious Monk’s mid-fifties composition. We’ll hear one of the original versions of “Brilliant Corners” from Monk’s 1956 Riverside release of the same name. Sonny Rollins’ tenor begins the variations followed by Monk, Eddie Henry’s alto and Max Roach’s drums. Sweden’s premiere pianist, Bobo Stenson, together with partners Anders Jormin (b) and Jon Falt (dr), returns from last week with “Octoberhavet” (October Sea) from his “Contra la Indecisión” [indecision against] (ECM 2018). 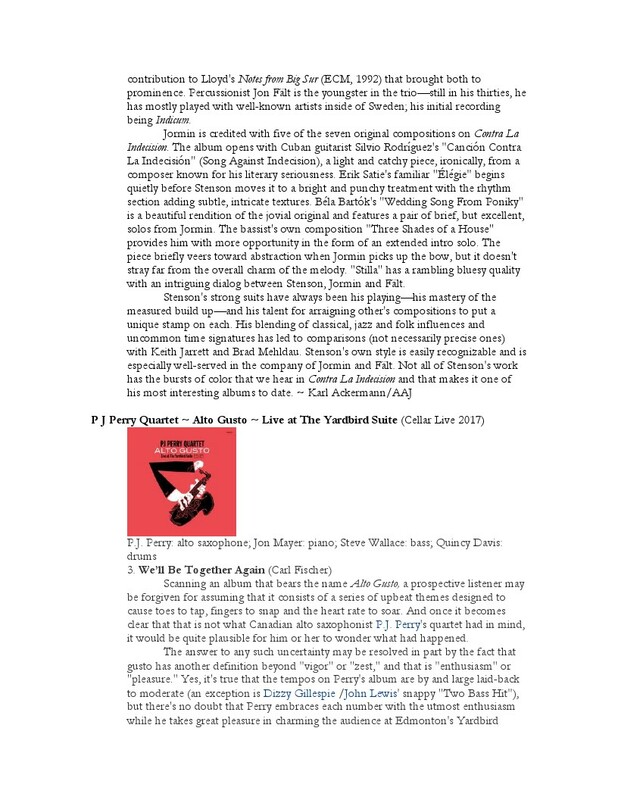 Newcomer Canadian’s P J Perry Quartet, on the heels of stellar reviews from All About Jazz’s Jack Bowers, brings this half to a close with his cover of Carl Fischer’s “We’ll Be Together Again” from his “Alto Gusto ~ Live at The Yardbird Suite” (Cellar Live 2017). Alto saxophonist P J warms us up to the permanence of romance. P J solos first followed by John Mayer’s piano. The sensational Canadian vocalist Laila Biali returns from last week with her “We Go” from her “Laila Biali” (ACT 2018) with help from the trumpet of Ambrose Akinmusire. John Coltrane interprets Jimmy Van Heusen’s “Like Someone in Love” from his “Lush Life” (Riverside 1958) with Red Garland (p), Earl May (b) and Art Taylor (dr). Japanese pianist Senri Oe follows with his “Just a Little Wine” from his “Answer July” (Pnd Records 2016) featuring a vocal by Theo Bleckmann with Yacine Boulares’ soprano sax in the background and soloing along with the leader and bassist Jim Robertson. 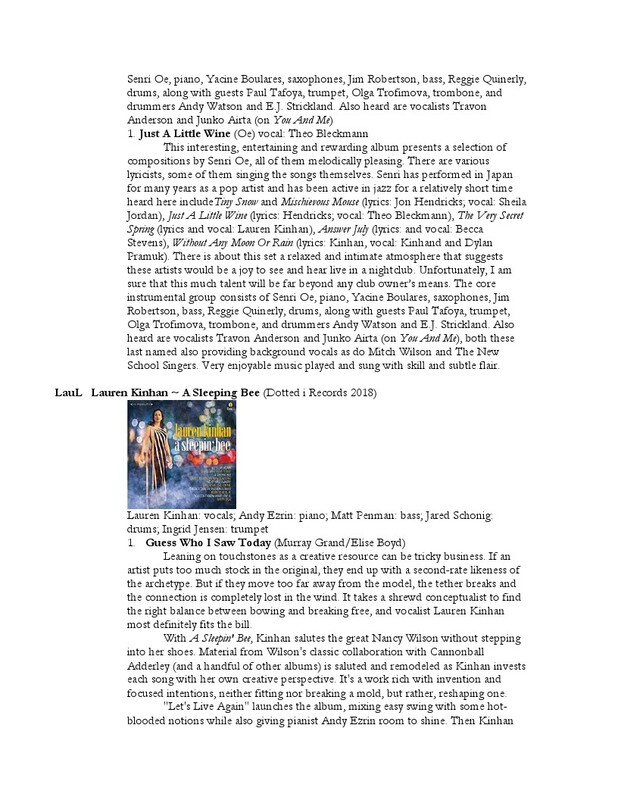 Lauren Kinhan returns with a cover of Grand and Boyd’s “Guess Who I Saw Today” from her “A Sleeping Bee” (Dotted i Records 2018) with help from pianist Andy Ezrin. From V.A. 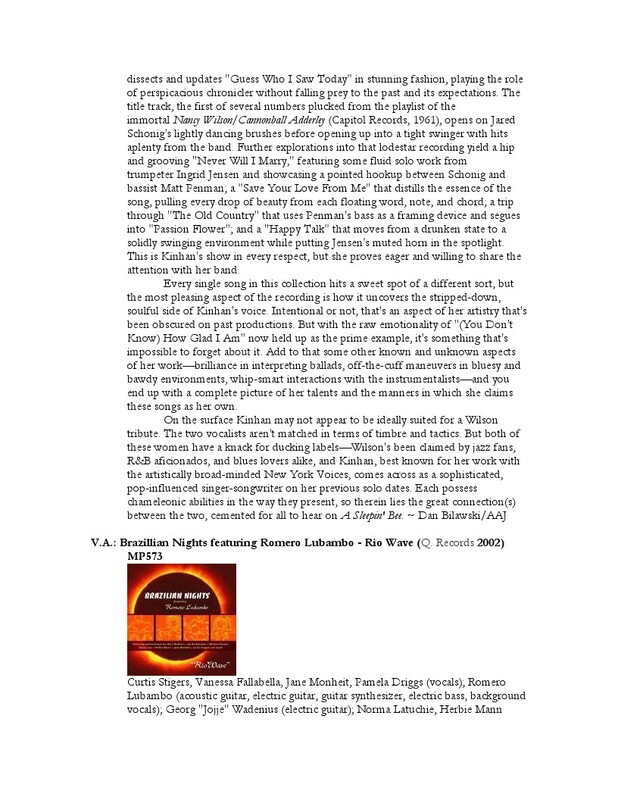 : Brazilian Nights featuring Romero Lubambo’s “Rio Wave” (Q. Records 2002), we’ll hear Jane Monheit’s treatment of Antônio Carlos Jobim’s “Triste” (Sad) with help from the guitar of Romero Lubambo. 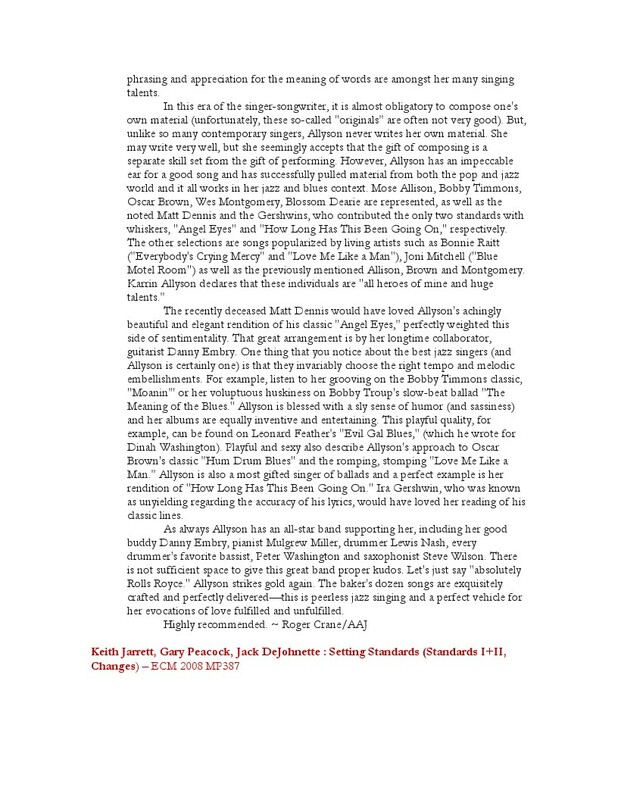 Karrin Allyson sends us home with that loving feeling with her cover of Matt Dennis and Earl Brent’s “Angel Eyes” from her “In Blue” (Concord Music Group 2002). 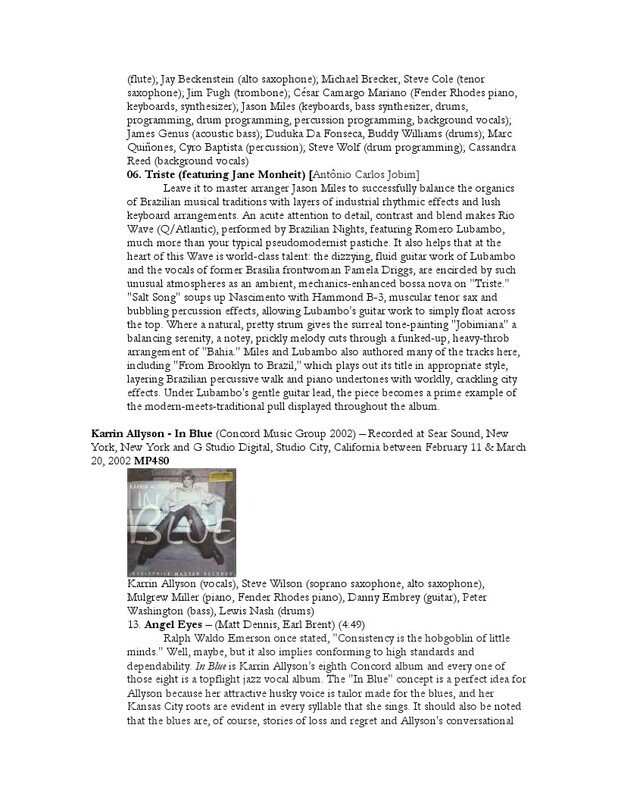 Steve Wilson’s alto and Mulgrew Miller’s piano surround Karrin’s vocal.